In July Tommy Burns successfully defended his heavyweight title against Bill Squires, knocking him out in dramatic fashion in just one round. As 1907 comes to a close, Burns, who wanted to truly be a worldwide heavyweight champion, traveled to Europe in search of bouts with their champs. Jim 'Gunner' Moir of England was his first fight on the trip, and Herriman thinks very little for Burns' chances. Loren Taylor created Mom 'n' Pop in 1924 and Wood Cowan took it over in 1928. The strip was renamed The Newfangles in 1932 and ended in 1936. Margaret Hays usually worked as the writer for her partner Grace Drayton, but here's a rare instance where she worked alone on a newspaper comic strip. Her artwork is sort of a hybrid of her sister (?) Mary Hays and partner Grace -- notice the Campbell Kids style faces. 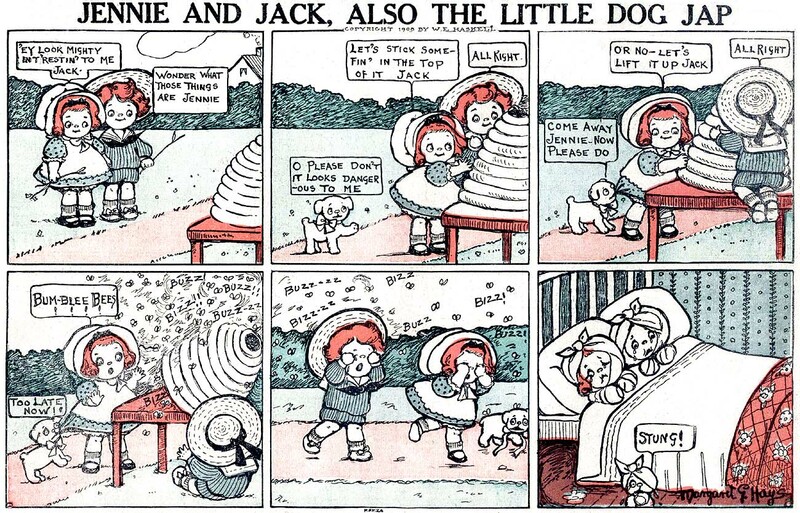 Jennie and Jack Also the Little Dog Jap ran in the Boston Herald Sunday comics section as a late entry in their third go-round of producing their own comics. 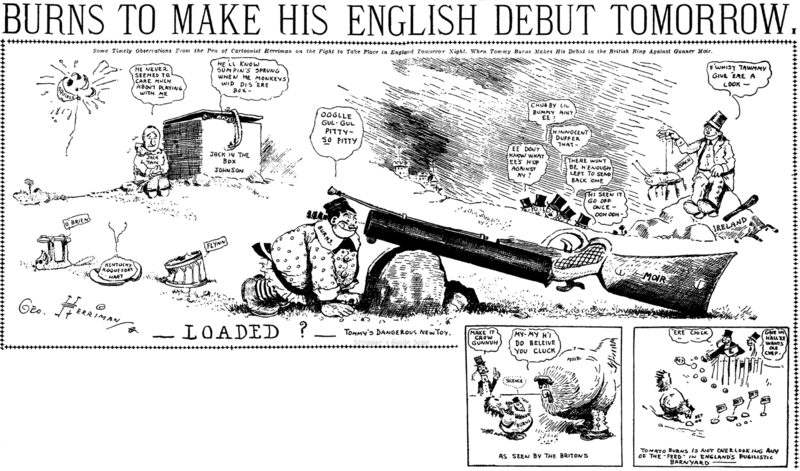 The strip began on March 8 1908 and ended either on August 9 (end in the Boston Herald) or August 30 (end in some syndicated papers). 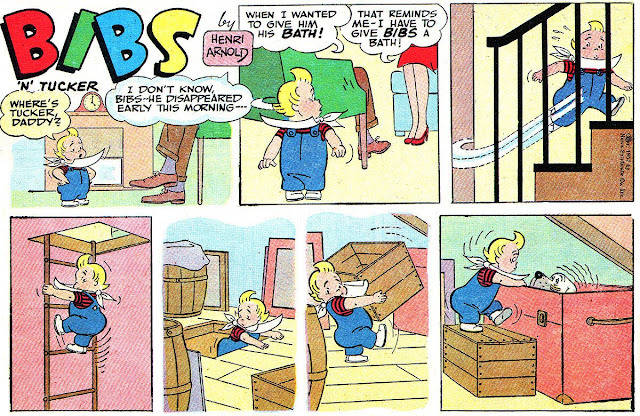 As was usual with the Hays productions, the strips read more like storybooks than comic strips. Margaret Gebbie Hays was Grace Gebbie Wiederseim Drayton's sister; Mary A. Hays (later Mary Hays Huber) was Margaret's daughter. I have a particular interest in Mary Hays Huber, but it's taken me years to discover who she was. She did many holiday illustrations/designs for both the Gibson and Dennison companies, but she's very very rarely credited (I've seen one piece initialed "MH"). She also did a few "children's pages" for women's magazines; her name is more likely to appear on these. We've featured quite a few of these features that ran in the Sunday comics section of the New York Daily News on a space-available basis. 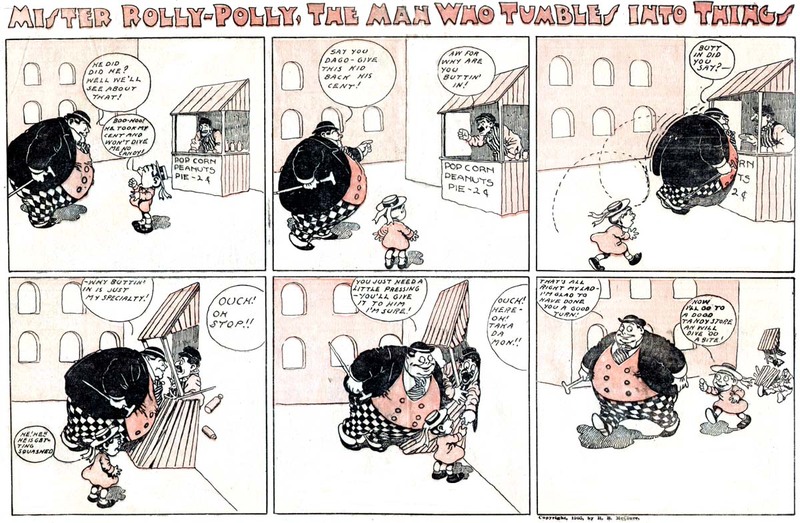 This one, Bibs 'n' Tucker, was by Henri Arnold, the cartoonist best-known for his long-running Jumble puzzle feature. The strip is about a toddler, Bibs, and his dog Tucker. Since the strip ran only on rare occasions the gags and characters are pretty generic, the only hook being that Bibs wears a bib that seems to have the same over-starching problem as Dilbert's tie. 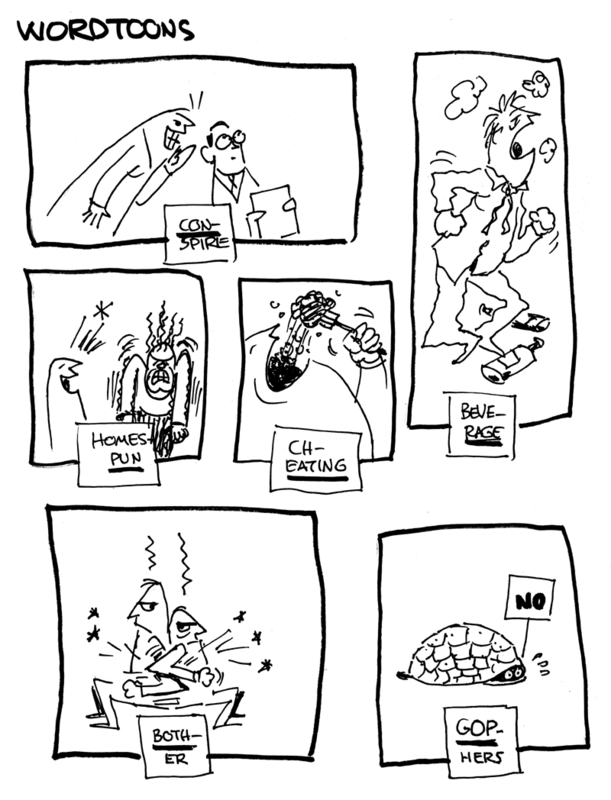 I'm only aware of the strip running on a few isolated occasions. It began sometime in 1955 and the last installment seems to have run on August 18 1957. Anyone have a run of Daily News sections from the 1950s who can help out on confirming the start and end dates of these ROP features? EDIT: Michael Vassallo says his first example is 3/20/55. Can anyone go back farther than that? I have some but have never come across this strip. What with this and my interest in Bumper to Bumper, I guess researching this paper when I am in New York is at the top of my list. The Library of Congress has an original cartoon drawing by him from 1942 in the Art Wood Collection. The title pretty much tells you everything you need to know about this short-lived feature by Ed Carey that ran in one version of the McClure Sunday section from December 3 1905 to February 4 1906.